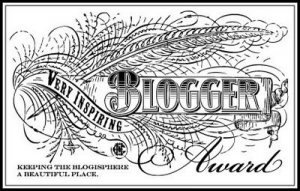 Well I’d like to take the time to gratefully and joyfully accept the “Sisterhood of the World Bloggers Award” from my dear friend Charity over at What Matters Most. Charity was my first, “Hey! I-don’t-know-you-but-I-was-really-encouraged-by-your-blog-and-decided-to-start-following-you friend!” I am so thankful I stumbled across her blog that dishes out real life from an eternal perspective, it’s so refreshing! I’m in awe of Him who called us to himself when I think about how, from my small pocket of the world, I can be encouraged and be an encouragement to so many sisters (and brothers!) in Christ around the globe. Leave it to the Lord to redeem something as versatile and volatile as the internet and use it for His kingdom purposes. I’m humbled to be a part of His work. 1) I’m addicted to peanut butter M&M’s. 2) My favorite performing role as a dancer involved wearing facial hair and boot spats. 3) My sister taught me how to walk. 4) I tap dance in grocery store aisles more often than I’d like to admit. 5) I’m currently memorizing Psalm 62. 6) I once ate an entire batch of homemade chocolate chip cookie dough. By myself. 7) On our wedding day, while standing at the altar, my husband was referred to as “Mr. Quaker Oats” and I was deemed “Froot Loops” by the officiating pastor. 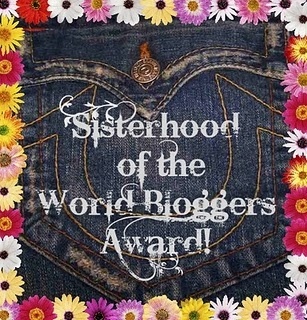 I also get to nominate other sisters in Christ who have blessed me via the blogosphere. And, here is where I am slightly awfully embarrassed. I’m now keenly aware of the fact that I don’t have very many blogging friends as I’m relatively new to the blogosphere (my first post is dated in May of this year). As I thought of the women who I would love to nominate for this award, my palms started to sweat as I read Charity’s nominations. Woops. I came to the realization that several of the women I follow are women I found through Charity! Remember, she was my first “blog-friend” so I just snooped and sniped all of her friends and made them my own! That being said, many of the women I mention below have just received this award and since I don’t want to go handing off awards to any ol’ blogger for the sake of fulfilling “the requirements” I thought I would mention these ladies again in the hopes that my faithful readers will also be blessed by their perspectives and passion for living for Jesus. As for those who are receiving this award for the first time, hooray! You are also a huge gift to this burnt out soul. Stay strong and keep writing, at least one human being is being refreshed by your willingness to share. This prayer was passed on to me by Charity and I wanted to keep it circulating so that we may all be reminded of the capable God we worship in this life in joyful juxtaposition. I loved this!! Your writing is so fun to read but it is also so beautifully directed at our God. I am so blessed to have you as a sister in Christ. Thank you for yet another smile and thank you for your words pertaining to my blogs. You really encouraged me. Congratulations on your award you have a beautiful blog. Thank you so much! 🙂 I stopped by your blog and love your passion for donkeys and animals, what a sweet farm you have! God bless you Melody! Thank you, sweet sister! I’m honored to be mentioned here and humbly thankful that you find something useful on my blog. Keep writing for His glory! It was my pleasure! Your name popped into my head almost immediately 🙂 Thank you for the words of encouragement!